We've been fans of Mosstika's delightful brand of moss graffiti for quite some time now, and were excited to see a few more tag-ups added to the collection. Instead of using spraypaint, the images are made of living greenery and add a splash of color and texture to some of New York City's less attractive streets. Click through our gallery to see some of Mosstika's newer creations for some green graffiti inspiration. The brainchild of artist Edina Tokodi, Mosstika challenges traditional notions of graffiti by adding living moss to city walls. The often tongue-in-cheek masterpieces have an element of surprise that, in our opinion, makes them even more appealing than the ubiquitous spraypainted walls you might see almost anywhere in New York City. Some of our Mosstika favorites include giant pine air fresheners and moss Bambis, but we’re also intrigued by some of the newer offerings, which include green fishes and, well, we’re not quite sure what this is but it’s certainly eye-catching! Tokodi’s works may seem fragile (they are made of living plants, after all), so you might be surprised to hear that these moss fish in downtown Brooklyn survived Hurricane Sandy with just a bit of wear and tear. For even more green graffiti goodness, check out our past Mosstika posts here and here. The brainchild of artist Edina Tokodi, Mosstika challenges traditional notions of graffiti by adding living moss to city walls. The often tongue-in-cheek masterpieces have an element of surprise that, in our opinion, makes them even more appealing than the ubiquitous spraypainted walls you might see almost anywhere in New York City. Some of our Mosstika favorites include giant pine air fresheners and moss Bambis, but we're also intrigued by some of the newer offerings, which include green fishes and zebras. And don't forget this grass Yeti that popped up at last year's FIGMENT festival! 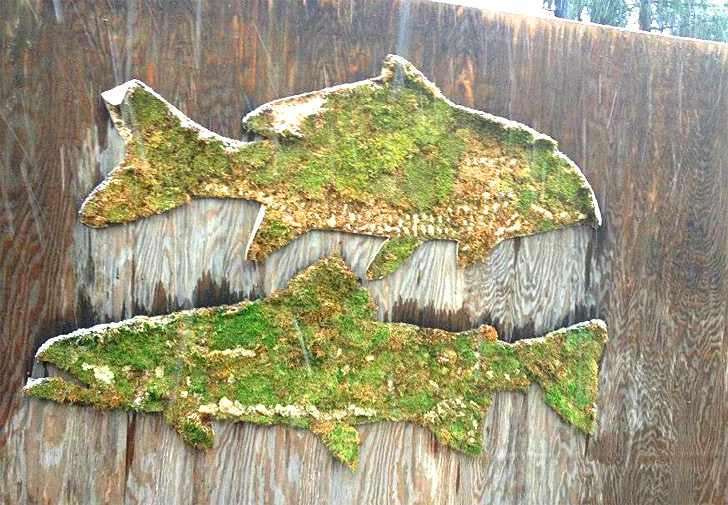 Tokodi's works may seem fragile (they are made of living plants, after all), so you might be surprised to hear that these moss fish in downtown Brooklyn survived Hurricane Sandy with just a bit of wear and tear. For even more green graffiti goodness, check out our past Mosstika posts here and here.